Our mission is to provide quality renovation services to improve our customers’ homes. We know the value and efficiency that proper awnings can bring to a home and, for that, we utilize the most-experienced technicians for our installment team. 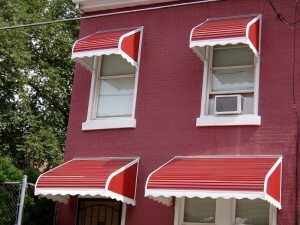 We can make custom aluminum awnings with a variety of color choices, perfect for your unique home and sense of style! 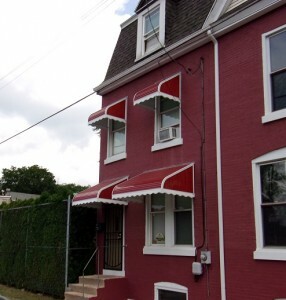 How will awnings improve your home? An awning provides wide-spread coverage and, therefore, shade is not dramatically effected by the sun’s rotation throughout the day. Outdoor umbrellas, along with their cumbersome poles and ropes, hardly provide direct shade for longer than a few hours on a blazing summer’s day. Awnings can also provide shelter from light rain showers during outdoor events. At Weidner Sweigart Electric & More we make sure to involve and engage our customers during the planning process so that all measurements and spacial arrangements are approved prior to installment. We are dedicated to taking the time to learn exactly what our customers expect from their upgrade. Responsible investments will eventually pay for themselves, and often more. Not only can awnings serve as catalysts for outdoor environment control, they can also make positive impacts on your use of energy and utilities indoors. According to the American Society of Heating and Air Conditioning, fabric awnings can reduce the interior heating of your home by up to 77 percent in the summer seasons. Furthermore, the Professional Awning Manufactures Association says that the shade provided by awnings can reduce air conditioning costs by as much as 25 percent. Awnings come in a variety of forms that are both practically and aesthetically beneficial to a home. Not only can awnings be used to upgrade the appearance of windows, patios, porches, or deck space, but they can increase the efficiency of a home as well. In addition to all of the internal cost-cutting that awnings can provide, their flexibility in design allows for individuality of each installment. For homeowners who are interested in showing off their new household accessory, one may want to consider permanent awnings with a unique and personal fabric design. Permanent awnings installed above windows or doorways are perfect ways to accessorize and boost a home’s sense of personality. For those who appreciate subtlety and convenience, retractable awnings are the way to go. Retractable and extendable awnings allow homeowners to decide when they want their awnings to be visible and when it is more appropriate for them to be hidden. This luxury of choice also gives homeowners more security in their investment because weather damages are more easily avoidable. Let Weidner Sweigart Electric & More help turn your dream home into a reality. If you're ready to discuss your next project or home need with us, please use the button below. Tell us about your situation and we will get back to you quickly with our recommended solution.